Disney Frozen Sisters Framed Minky Fabric This fabric is great for craft, and home decor projects..
Disney Mickey Mouse Face Toss Knit Fabric, features Mickey's head with various expressions.tossed on..
Disney Princess Sofia and Friends satin features the First Princess Sofia with Mia the Blue Bird, an.. 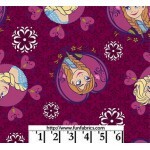 Frozen Movie satin fabric licensed by Disney. Frozen Sisters Skating Blue Satin, This fabric is grea..
Little Mermaid Ariel Fearless Dreamer Knit Fabric, features Little Mermaid Ariel with the words "Fea..
Disney Mickey and Minnie Mouse True Love Knit Fabric, features Mickey with Minnie Mouse heads tossed..
Disney Minnie Mouse Best Bow Knit Fabric, features Minnie Mouse in various poses tossed with bows on..
Disney Minnie Mouse Go with the Bow Knit Fabric, features Minnie Mouse in various poses tossed with ..
Super Mario Game Time Knit Fabric, features Nintendo' Super Mario icons with gray stripes on a white..